This Thursday, Verizon customers will have a choice between two more versions of the HTC One (M8). Both offer two new colors, as far as Verizon customers are concerned. One is Glamour Red, and the other one is Amber Gold. Currently, the HTC One (M8) is available from the nation's largest carrier in Gunmetal Gray and Glacial Silver. Verizon is currently running a Father's Day sale, and any smartphone priced at $199.99 or more bought under contract, receives a $100 haircut. That makes the phone just $99.99 with a signed two year pact at Verizon. HTC's flagship model is a little over two months old and is currently battling it out against the Samsung Galaxy S5 in the high-end market. Soon, the LG G3 will join the fray. To compete against the QHD screen on LG's flagship model, and on the rumored Samsung Galaxy S5 Prime, HTC is rumored to be working on two new variants of the HTC One (M8) for the "premium" market. 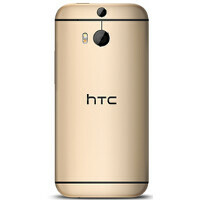 The HTC One (M8) Plus is expected to be equipped with a 5.5 inch 1440 x 2560 QHD screen, with a Snapdragon 805 under the hood, 3GB of RAM on board, and a 13MP camera on back with OIS. This model is supposedly waterproof. The HTC One (M8) Advance will supposedly keep the same specs as the "Plus," but will stuff it all inside a plastic casing. This version of the phone might be offered in Asian markets only. Hahaha been had my gold M8 from At&t! would you like a medal for that?? ?